Esophageal carcinoma is histologically divided into squamous cell carcinoma and adenocarcinoma. Squamous cell carcinoma consists of cluster of dysplastic squamous epithelium and keratin pearls. Squamous cell carcinoma present as necrotic ulceration, diffuse infiltrating lesion or polypoid lesion affecting the upper and middle thirds of the esophagus. Adenocarcinoma present with mucin producing cell and glandular. Adenocarcinoma mostly affect the lower third of esophagus. Initially adenocarcinoma may appear as raise nodular mass which is ulcerated in nature. Adenocarcinoma mostly occur as a result of progression of Barrett esophagus. Patient mostly present with advanced stages of esophageal carcinoma and the treatment at this time will focus on palliation therapy ( surgical resection treatment, radiation therapy and chemotherapy) as the survival is less than 15% in 5 years. Patient with esophageal carcinoma may complain of progressive nature of dysphagia /difficulty swallowing of solid food which later affect liquid, anorexia, hematemesis, odynophagia and loss of weight. 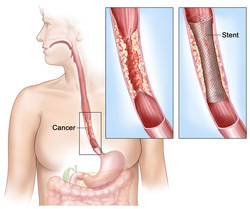 Esophageal carcinoma may affect mostly older people, genetic factors, achalasia, Barrett esophagus, corrosive ingestion/esophagitis, alcohol, webs of esophagus, diverticuli and smoking. 1.Bytzer, Peter, Peer Brehm Christensen, Per Damkier, Kirsten Vinding, and Niels Seersholm. “Adenocarcinoma of the Esophagus and Barrett’s Esophagus: a Population-based Study.” The American Journal of Gastroenterology 94, no. 1 (January 1999): 86–91. doi:10.1111/j.1572-0241.1999.00776.x. 2.Ide, Hiroko, Tsutomu Nakamura, Kazuhiko Hayashi, Takeshi Endo, Ataru Kobayashi, Reiki Eguchi, and Fujio Hanyu. “Esophageal Squamous Cell Carcinoma: Pathology and Prognosis.” World Journal of Surgery 18, no. 3 (May 1, 1994): 321–330. doi:10.1007/BF00316810.